Sure, I had seen how many people had clicked ‘going’ on the Facebook page, but I only saw that as a number and I didn’t think of the power behind it. When I first saw a post about the ‘School Strike’ in November 2018 on Facebook, I admittedly didn’t give it much attention. However, as the date drew nearer, students started talking about it more and more, and we all started to consider whether this was something we should be a part of. The School Executive was asked about the idea of student involvement, and based on the relevance to our studies in Geography and Science, it was decided that participation was allowed. In the week leading up to the strike, we began to plan posters as well as the logistics of the day. 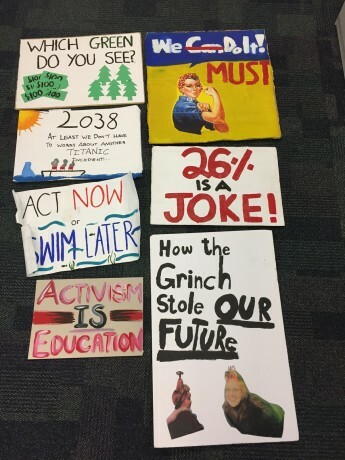 Even the students who didn’t care about climate change or worse yet, don't believe in it, were involved in the poster making. These small acts were raising awareness and soon around 100 students from my school (Santa Sabina College) had committed themselves to taking part in the strike. 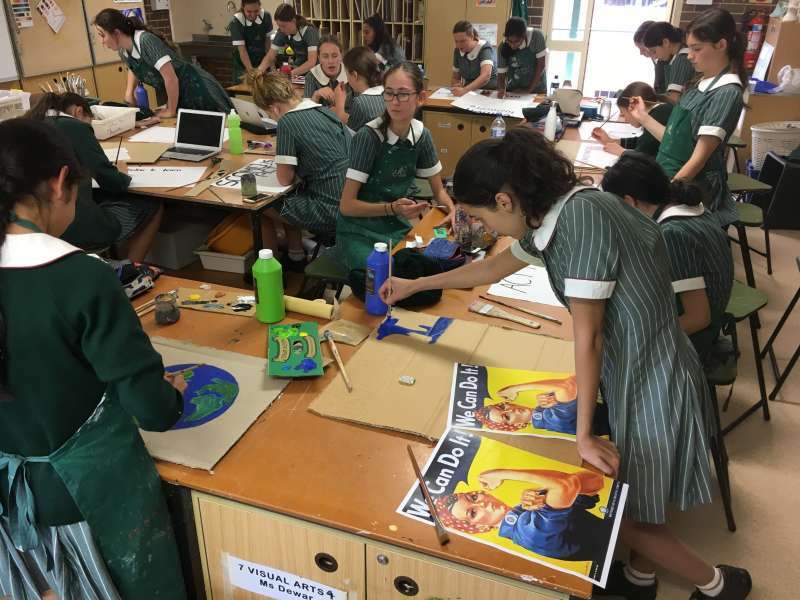 Students at Santa Sabina College preparing placards for the student strike. I could barely sleep the night before the strike, and though I was extremely excited to take part I was also sceptical about the total number of people that might turn out. I shouldn’t have been worried. I was totally overwhelmed with the amount of other students and people that were participating. I actually started tearing up because it made me realise that people do care. Before this, I had no awareness of kids my age acting on climate change on their own accord. Sure, I had seen how many people had clicked ‘going’ on the Facebook page, but I only saw that as a number and I didn’t think of the power behind it. Right in front of me thousands of school kids who wanted to be there because they wanted change. They know that what's occurring right now isn't fair on anybody or anything and the government must act upon that. The day went by pretty quickly and it’s a bit of a blur, but I just remember how inspired and empowered I felt. Over the course of two hours, there was chanting, speeches, performances and more chanting. I was in the middle section of the crowd and so I couldn’t really hear everything that was being said, but what I could hear really resonated with me. It made me want to do so much more than I already did. Although I was and always have been very passionate about climate change, I had never really been that involved in anything. Besides occasionally signing a petition online, making sure my friends pick up their rubbish or telling everyone in my year 9 camp group to love nature and be grateful for it, I’d never really done anything substantial. After that day, I knew I had to start doing more. 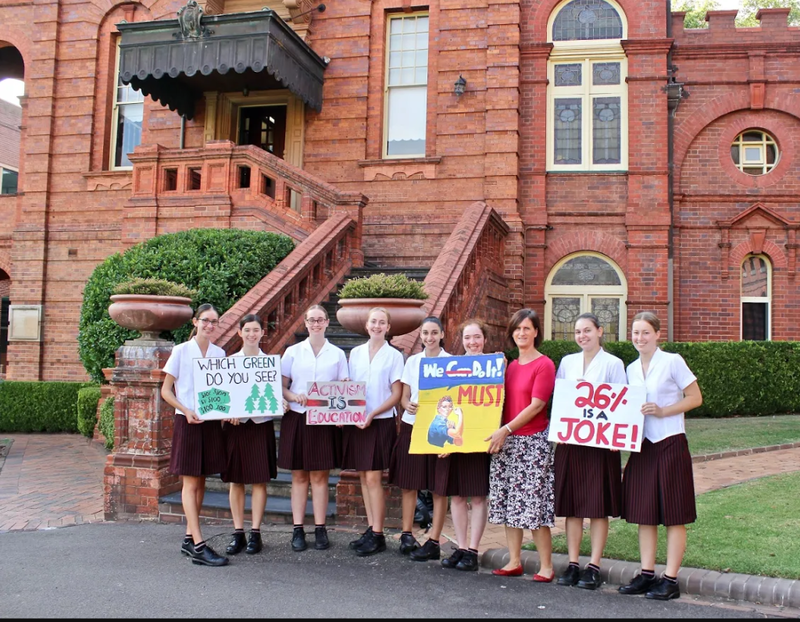 Handover of signs to MoAD curator Libby Stewart by students at Santa Sabina College on 11 March 2019. 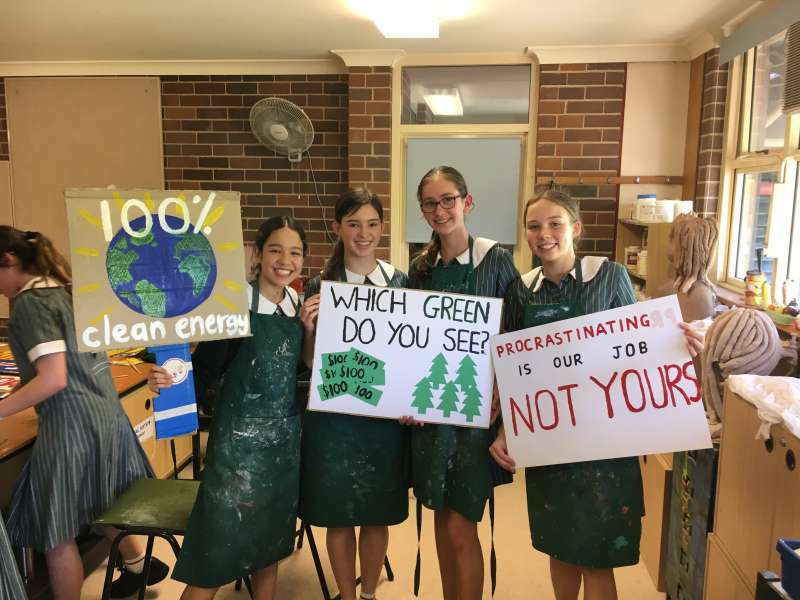 The students are (l-r) Clarissa Kalamvokis, Rachel Frecker, Catherine Ryan (who made the IKEA sign), Eloise Struthers, Clara Elias, Elissa Baker, Naomi Marta and Hannah Svoboda. I started by just doing smaller things. I began sharing many more posts on my social media, which actually was a great way for me to continue my activism whilst being on holidays or away. As most of us do spend a lot of time on social media, such media activism is quite effective. By just having that casual climate-related post come up in your feed, it reminds you of the severity of the issue and how you need to be a part of the solution. As well as that, I started to make small habitual changes in my life, for instance going vegetarian, taking the bus more and trying to bring my plastic usage to an absolute minimum. As far as activism goes, I am now more involved than I ever have been before. One of my babysitters from when I was younger saw that I went to the strike and got in contact with me via Facebook messenger and told me that she was an Australian Youth Climate Coalition (AYCC) employee and explained a few of their programs I might be interested in and could apply for. One of them in particular caught my attention. It was the AYCC Student Climate Leadership Program. I left it for a few weeks and then one night out of nowhere remembered it and decided to apply. A few days later I found out that I’d been accepted. So, as of right now, I am five weeks into the SCLP and am loving it. It’s basically a four month program which focuses on climate action, climate justice, how to effectively make change, campaigning and leadership skills etc. Even though I am only five weeks in, I feel like I’ve learnt so much and am ready to start making change! Students at Santa Sabina College with placards for the student strike. Through this program, I’ve also had many more exciting experiences. A few weeks ago, I was one of six school students who got to meet with Tanya Plibersek (the current Deputy Leader of the Labor Party) to discuss the climate goals of the strike and what policies need to be put in place. Unfortunately, Ms Plibersek herself wasn't there, but the meeting went ahead with one of her staff and it was a great experience nevertheless. There is also talk of holding another meeting with her after the election. If that itself wasn’t exciting enough, I’m also now one of the students helping organise the upcoming strike! I’ve been on a number of calls in the past few weeks discussing the details and logistics of the strike, which are things I didn’t even think about before. I am beyond excited for the strike, not only because I’m much more involved in it, but also because if it’s anything like last year, it will be amazing! I am ready to be inspired and overwhelmed in the best way possible and hope that there are many other young people in the crowd who are just like that. When you think about it, the 2018 strike acted as a catalyst for all my activism, as I’m sure the next will for many others too. 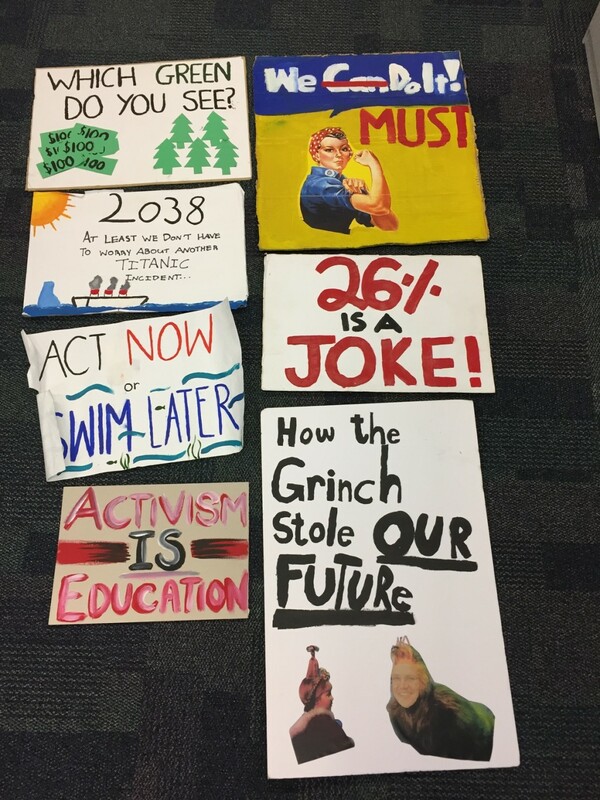 Eloise Struthers took part in the November 2018 'School Strike 4 Climate' protest when she was a Year 9 student at Santa Sabina College, Sydney. 'School Strike 4 Climate' is an international movement of students holding demonstrations to demand political action on climate change.